Almost every Boulder resident, as well as many from surrounding communities, has read or heard of the conflicts between the Open Space visitors who favor recreation uses and those who favor a focus on resource conservation. Since Boulder’s Open Space land hosts more than 4 million visits a year, this means a lot of time and energy spent in what ends up being overheated and emotional public arguments. 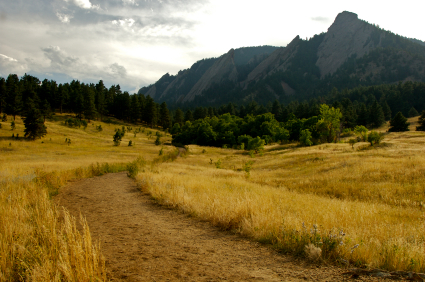 Boulder residents hold tightly to their favorite reasons for loving Open Space, whether it is a place for their dogs to run off leash, trails to hike on, or preservation of critical wildlife habitat. In the past ten years, city elected and appointed officials, as well as Open Space staff and board members have tried to referee and balance all the competing voices in order to preserve both ongoing support for the Open Space program and the irreplaceable natural resources of the Open Space system. Trail Study Area Plans, known in the Open Space parlance as TSA’s, are the vehicle that has been created to match the directions of the system-wide management plans to specific geographic parts of the Open Space system. This allows Open Space users to focus on the trails, trailheads and uses of their special places, and lets them influence the results of this planning process. Since TSA’s are where the rubber meets the road for visitor use, this is where a lot of the disagreements regarding uses of Open Space lands have played out. Two TSA’s have been completed, one for the open grasslands southeast of the city of Boulder, and one directly to the west, that is comprised of grasslands and mesas leading up to the foothills to the south of Eldorado Springs Drive, with some of the most important wildlife habitat of the entire Open Space system. TSA planning has made extensive efforts to involve Open Space users, but these efforts have been based on the old school planning school process, with Open Space staff experts creating draft plans, which are then presented to the public for comments. This sets up what has turned into adversarial confrontations among public users promoting their particular interest, the Open Space staff and board members, who defend their plan, then ultimately the City Council. Everyone involved recognizes this as a process that is a damaging waste of time and energy, so a different type of TSA planning process has been designed for the current West TSA Plan. The West TSA area, which extends from Linden Drive on the north to Eldorado Springs Drive on the south, from Broadway on the east and well into the foothills on the west, is heavily used and valued by Open Space users because of the exceptional natural environment and the high quality recreational opportunities. The community of users has a very high degree of interest in the outcome of the West TSA planning process, and there are a correspondingly large number of perspectives for how the area should be managed. The Open Space department responded to this high degree of interest by designing a collaborative planning process that incorporates the vision and opinions of the community, while building support for the resulting plan and implementation. A citizen advisory group, representing a cross-section of user interests and known as the Community Collaborative Group (of course, now called the CCG) was formed through a caucus-style meeting held in September, 2009. The caucus meeting generated its own conflicts when the recreational users in general, and mountain bike interests specifically, attempted to fill all the positions with their members, who turned out in large numbers to do so. This was corrected, and now the advisory group makeup is relatively well balanced among the various user interests, with the exception of the neighborhoods that are adjacent to the boundaries of the West TSA. Open Space staff and the Open Space board members responded to this by taking on the responsibility of making sure that neighbors and their interests are fully represented. More opportunities for public comment were incorporated into the agenda of each CCG meeting to ensure that anyone with an interest in Open Space can express opinions and ideas. The expectations and requirements for each CCG member to fully represent the interests of his or her community, whether that community is recreational users, conservationists or neighborhood residents was clearly laid out and this is followed up in each meeting. The CCG began its work in October, with an effort to establish a good working relationship among group members to overcome the rocky start. The Open Space staff has spent the past several months presenting the background information of the established city and Open Space plans and policies that are the basis for all TSA plans. This will ensure that the whole group will be working with the same understanding of the resources and management issues, and of the already-approved constraints. The next steps for the CCG include defining future desired conditions of the West TSA resources, to be followed by recommendations for how to implement actions to achieve the desired future. The West TSA planning process will be completed by the end of 2010. I would note that some neighborhood participants in the process are not convinced that representation for them “was corrected.” Some have attended CCG meetings and expressed the view that their interests are not being represented. Time will tell. There was very poor neighborhood attendance recently for a West TSA field trip that was organized by the “Central Reps”. The date was on a Saturday. The weather was quite nice (and the mountain snow was still poor). Notification was short (to take advantage of good weather) but well distributed. Only myself, my son and his girlfriend came as neighborhood participants. Neighbors need to take advantage of the many opportunities to participate in the process (or not complain if the outcome is not to their liking). Mountain bikers are not part of the problem, we are part of the solution. The extensive public lands volunteerism of the Boulder MountainBike Alliance (BMA) speaks for itself. BMA was recently awarded the 2009 Boulder County Land Conservation Partnership Program Award. Instead of throwing around accusations, why don’t we try working together for the benefit of Boulder’s Open Space? Depoliticize the Open Space debate? Impossible? Perhaps. But as constructive Boulder citizens, mountain bikers will never stop trying. We are here to stay. Let’s work together.